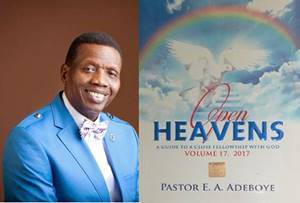 Open Heavens 14 November 2017: Tuesday daily devotional by Pastor Adeboye – Vessels: How Prepared? Topic: Vessels: How Prepared? — Tuesday 14, November 2017. In Isaiah 6:1-8, Isaiah saw the Lord and this opened his eyes to see himself the way he truly was before God. As the brightness of God’s presence illuminated every aspect of his life, he had no choice but to seek divine assistance, and as he cried for help, God sent an angel to purify his unclean lips with a coal of fire. When you see Jesus, you will become a candidate for purification. Purification is essential because without being purged by God, your fruitfulness will be hampered (John 15:2). In other words, the more God refines you, the more likely He will use you for greater works. Many of us quote John 14:12 and claim that because we believe in Jesus, we automatically qualify for greater works. However, the truth is, there can be no greater works without divine refinement. God does not use unclean vessels for His work. If He has chosen you for an assignment and you come to the realization of how unfit you are for the work, it is because He wants you to be challenged, and He also wants you to ask for His purging and cleansing. It is not enough to be a vessel unto God. You should ensure that you are a vessel for honourable purposes. Beyond this, 2 Timothy 2:21 tells us that being purified is crucial to being used of God, and that although God may have His ways of purifying us, we also have a personal responsibility to purge ourselves. You have to put considerable effort to purge yourself. Those carnal habits you have must go! Little lies must go! Get rid of hypocrisy! Fruitlessness in soul-winning must go! The more you purge yourself, the more you will be a candidate for more and greater works. Don’t ever think that there is no more work to be done in the Kingdom. There is so much work yet to be done, and although the labourers are increasing in number, those purified and set apart for God’s use are few. Are you prepared to make yourself ready for God’s use? There are a few believers who have purged themselves and are prepared for any assignment God has for them; God will use such vessels to do just about anything, even as He bypasses many other vessels that are not pure enough for His use. Do all you can to be a pure and prepared vessel for God! Key Point: Purity makes a vessel usable for any assignment.